Found 12353 Beds Cat Products. 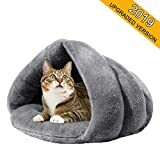 Handcrafted Felted Wool Cat Cave Bed (Large) For Cat and Kittens - Felted from 100% Natural Wool The Cat Cave is a cozy and comfortable cat bed handmade from all natural wool.Each one is made with love with the highest quality wool available to ensure that your cat is happy and healthy.This cat bed provides warmth, comfort and privacy to your cat. 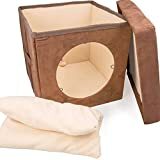 Perfect for cats to play, nap, rest and sleep inside or on top. Handmade with care and designed to make your cat feel at home(warm in wonter and cool in summer). Suitable for kittens, big cats and small dogs.It can also be used indoors and outdoors as padded mat. Free shipping. Shipping within 12 hrs from USA. 100% Money Back Guarantee!! 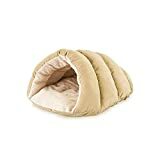 Pet Bed Soft Warm Cat Bed for Winter Cat Tent Self-Warming Sleeping Bed for Cats Fleece Pet Cave Bed for Winter Pets Puppy Indoor Pet Triangle Nest Pet Beds Warm Soft Triangle Cat/Dog Indoor Bed, high quality cat bed, small dog bed, cat tent, cat hut bed, pet tent, cat cave bed, cat pet bed, cat nest Pet Bed Cat Bed Features ❀Superior Quality Pet Bed : Durable plush fabric, filling high elasticity PP cotton, sleeping bag very soft skin-friendly and comfortable. 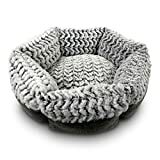 ❀Fine Workmanship pet bed: Precise sewing, invisible corners, clean & finished appearance, strong seam anti-bite. ❀ Perfect Size for Pet: 50*40*30cm/19.7*15.7*11.8inches. 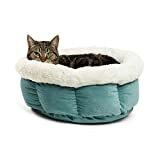 The pet bed is suitable for cats weight less than 15lb. For small dogs such as Chihuahua, little teddy, bichon. For normal sizes cats. You can also measure your cat to make sure the fit. All cats are Yoga Master, so size will not be a problem. ❀Easy to Clean: The pet bed Can machine wash or hand wash, very convenient. ❀The warm cat bed will Provide warmth, comfort, privacya and a sense of security for your pet. ❀The cat nest bed can be used as a padded mat, perfect for cats to play, nap, rest, relax and sleep inside or on top. How to use this cat bed? Dear customer, the cat bed is packaged with vacuum bag and during the shipment, it will be flat when you receive it. You can shake or pat the cat's nest, hold the top of the cat's nest and shake it to make it fluffy. Or, you may simply place it on the ground for several hours to let cat bed to be fluffy. Then pick up the top or knead it a bit and then pet triangle nest will be well structured like a cave. It looks like a pet tent and make your pet feel safe in it. In autumn and winter, pets always want to stay in a warm place especially cats. Get this pet bed and your cat will not sleep in your wardrobe. ♥Please Note: Air dry is recommended. "Most of us think caves are cold, dark, and scary, but the Milliard Premium Plush Pet Cave is none of those things! Instead, it’s a warm and soothing place for small pets to hide in a large and uncertain world for a most comfortable sleep? 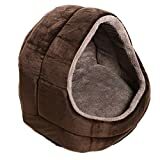 Cats, toy dog breeds, ferrets, rabbits or chinchillas can curl up in this soft and fuzzy enclosure when they feel nervous or insecure. The woolly texture insulates their body heat and the wraparound cave design cuddles pets for a bed they can curl up against. Its non-slip rubberized bottom also keeps pets from going for a ride if they like to dive into bed. Product Features Soft Velvet Material Comfortable Removable Cushion Non Slip Bottom Easily Foldable Machine Washable 14”L x 14”W x 14”H When the bed inevitably gets dirty, just toss it in your washing machine on low heat and gentle cycles for easy care and maintenance to give it a fresh start again! The Premium Plush Pet Cave has been produced by Milliard with your pet’s safety and comfort in mind for years of satisfaction. Don’t forget to check out other great products by Milliard!" Stylish Pet Lounge Provides Cozy Comfort And A Great Place To Hide Out! The Kitty Ziggy Den is a stylish pet hideout thats easy to assemble and move around the house. The attractive, soft faux suede goes nicely with your home décor. You can easily attach an Easyology Cat Tunnel ( sold separately ) and create a maze that leads to your cats prized lair! If you don't love your Easyology Kitty Ziggy Den, we'll refund your money, no questions asked. Click "Add to Cart" and order yours today! With the addition of a K&H Pet Bed Warmer, any pet bed can provide comfort and warmth. It can be placed inside virtually any pet bed and is easy to use. Just plug it in! It will become your cat or dog's favorite place to nap. Dual thermostats regulate temperature using only 4 watts. Pet is comfortable up to 102° when lying on a heated bed. The heater is set to keep the surface 12 to 15° above ambient air temperature and warms to a pleasing 102° degrees when the pet lies upon it. Cat & Small Dog - friendly design. Pet Craft Supply Co., pet beds are designed with your cat & dog's needs in mind. This comfy round bed has deep wall beds that provide the perfect getaway for a kitty or puppy to relax in comfort and style. Ultra soft - made with ultra soft material and added padding, Pet Craft beds create a special spot for pets to call their own. Machine washable - these beds are machine washable making it easier to maintain a comfortable and clean sleeping space at home. Measures 18x18 - perfect for your cat, or small dog. Not intended for chewing. Discontinue use if any part becomes loose or torn. Intended for pets only. Self Heating Cat Pad/Self-Warming Cat Dog Bed / 27.5" x 18.5"
Designed to Keep Your Pet Warm & Comfy 2 layers of self-warming fiber and 1 layer of mylar reflective film Self-warming fiber is tested by KAKEN Test Center Skin friendly plush top and ultra-soft fleece bottomSafe and Comfortable No chemical smell No electricity needed, safe for overnight and outdoor use No crinkle noise that always scares away timid animals Convenient and FoldableLightweight design allows for easy carry Foldable material makes it convenient to store Completely machine washable27.5 x 18.5 inch / 70 x 47 cm Big enough for all types of cats and small dogs Ideal to place on a surface such as sofa, floor, and cat perches Can also be used to add extra comfort to your pet carrier and outdoor pet house Mora Pets focus on bringing style and happiness into your pet's life. As our valued customer, you can always contact us for any questions and get our customer support 24/7. 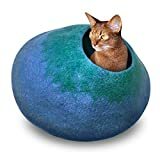 Find more details in our Mora Pets Amazon shop.